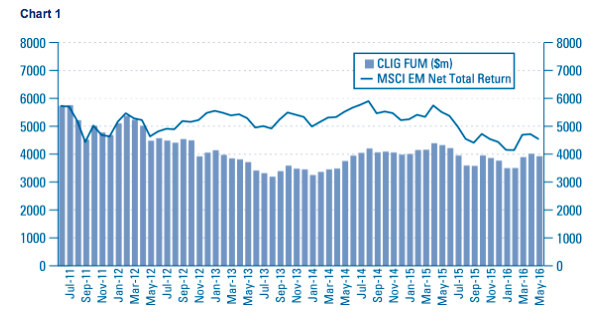 Summary: Not a bad statement, given CLIG is an emerging-market fund manager and its markets have slumped since the summer. A particular bright spot was the group’s forward guidance, which for 2016/17 is factoring in an acceleration of new client money. However, I continue to value the shares on today’s funds under management — which suggest the 24p per share dividend and 7% yield remain safe for now. I continue to hold. 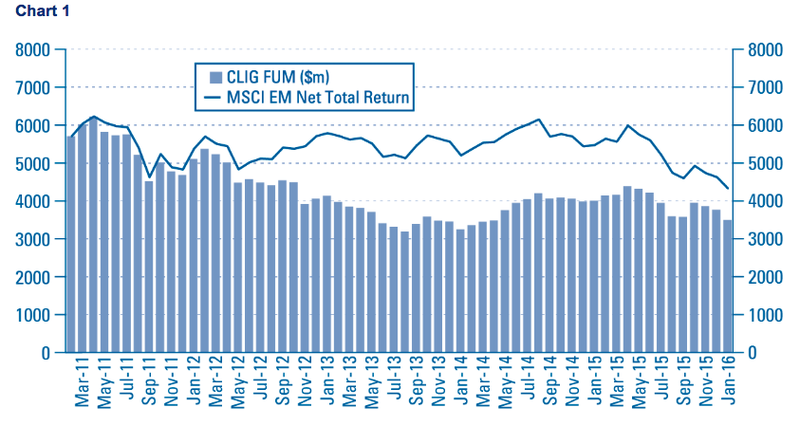 CLIG’s monthly updates on its website had already indicated the group’s funds under management (FUM) had dropped during its first half. Today’s statement confirmed FUM was $3.8bn — down from the $4.2bn seen at the preceding year-end. 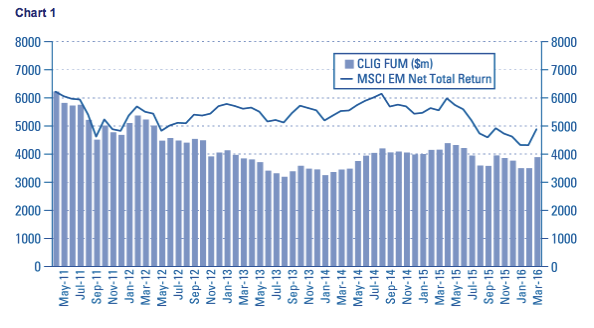 CLIG claimed that “continued net inflows of client money” as well as investment “outperformance” had helped mitigate the 17% drop suffered by emerging markets in general. 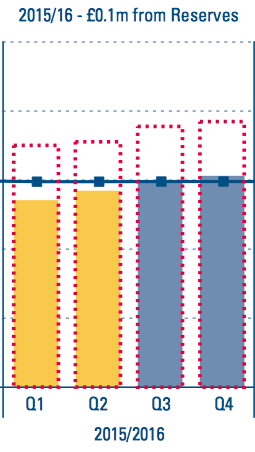 We can deduce some rough profit guesses from the ‘Reserves’ figures at the top of those charts. For 2015/16, ‘£0.1m from Reserves’ means earnings are expected to fall £0.1m short of the current £5.94m dividend payment — that is, £5.84m. However, for 2016/17, ‘£1.3m to Reserves’ means earnings are predicted to come in £1.3m over the current £5.94m dividend payment — that is, £7.24m. The 2016/17 projection looks encouraging. Indeed, this forecast has been buoyed by CLIG upping its prediction for new client money — the firm is now targeting $750m for the next financial year versus $500m it had been expecting for the current year. If the 2016/17 guidance proves accurate, it will mean earnings that year will top those reported for the preceding four years. What’s more, it will also give some much-needed extra cover for the 24p per share dividend. 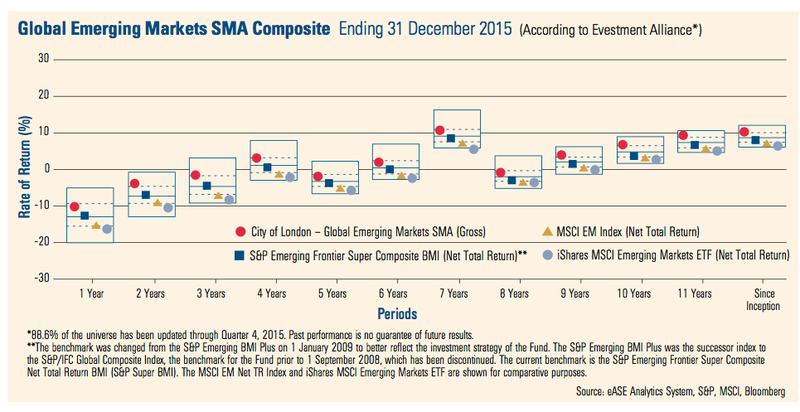 I guess that shows how a year can be a very long time in emerging markets! With £1 buying $1.45 and FUM at $3.8bn, I reckon current earnings could be running at £6.8m or 25.3p per share. Assuming net cash remains at around £10m or 38p per share, my enterprise value (EV) calculation for CLIG is £80m or 287p per share. Dividing that EV by my earnings guess gives me a possible P/E of 11-12. That multiple does not look outlandish at present. Furthermore, my earnings guess supports what is likely to be the sixth consecutive year of a 24p per share dividend — as well as the present 7% yield on the shares. * Next update — Interim results 15th February. This entry was posted in City of London Investment, My Shares and tagged City of London Investment, CLIG on January 12, 2016 by Maynard Paton. This is annoying. CLIG has now published a presentation to accompany today’s RNS. The firm published a presentation this time last year, and I did check for one this time, but there was nothing by late morning. Oh well — let’s have a look anyway. It will be interesting to see if any changes incur greater annual costs to shareholders. I wonder if the term “uncompetitive” suggests some staff may not be all that thrilled with the current set-up. 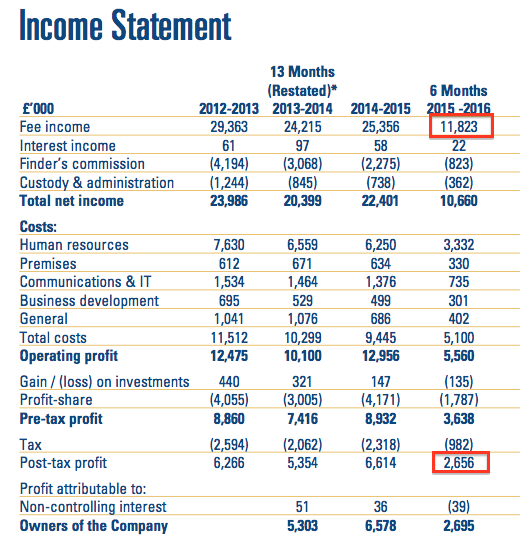 I see turnover less commissions for H1 2016 and H1 2015 was £11.0m for both halves. Third-party commissions paid by CLIG are currently in run-off and will gradually decline to zero by 2020/21. 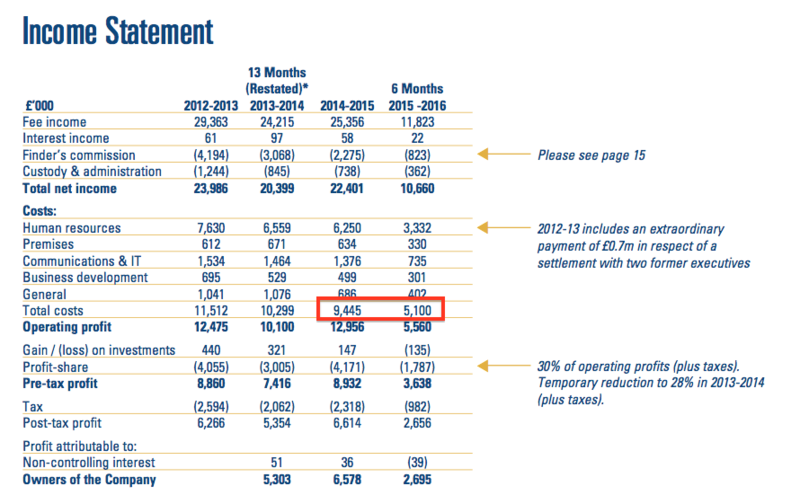 So lower management fees are being offset somewhat by lower commissions. However, the large dividend payment during the first half has meant cash and investments (less minority-owned investments) less regulatory required capital (of £1.6m) comes to £8.3m or 31p per share. I had surplus cash etc at £10m in the Blog post above. Essentially operating costs now include $8m (previously $7m) and SGD$1m (previously SGD$1.3m). Tax is now 27% (previously 26%). That means my earnings guess in the original Blog post above is a tad too optimistic. 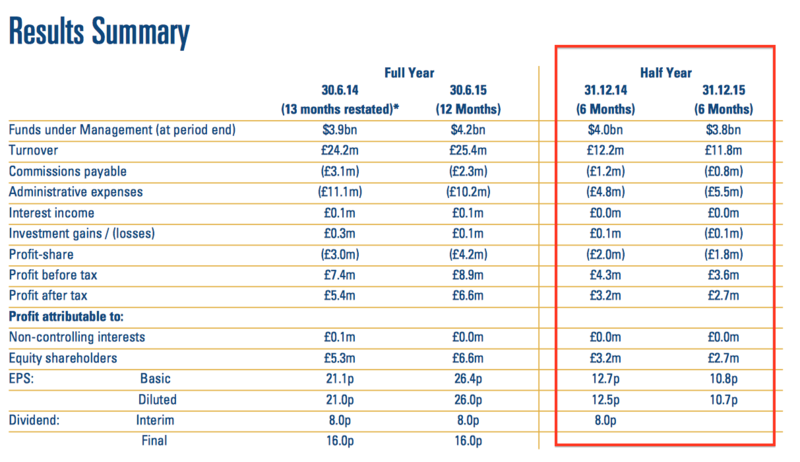 So… FUM of $3.8bn at £1:$1.45 gives £6.26m (not £6.78m) and EPS of 23.4p per share (not 25.3p per share). 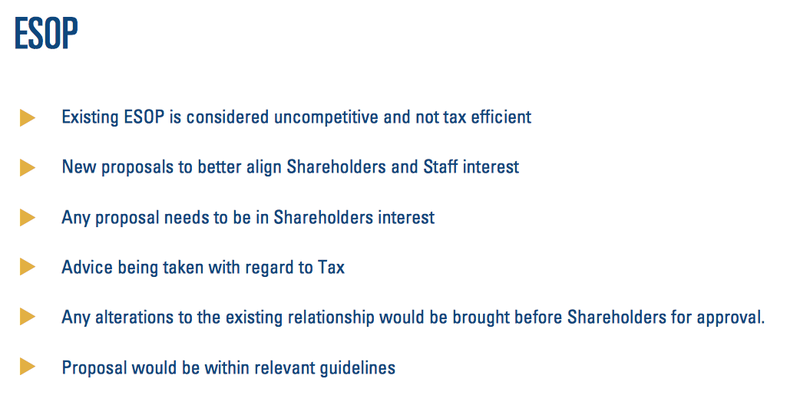 FFS that contradicts what I wrote in the Blog post above — the 24p per share dividend may NOT be covered! At 335p, the EV calculations are £81.5m and 304p per share. With the lower EPS guess, my EV/EPS multiple comes to 13.0x. I must admit, I doubt many investors would pay that multiple given CLIG’s earnings have bobbed around between 20p and 26p per share in the last few years… and having dropped from 30p-plus per share seen during 2011 and 2012. I guess it is the promise of that sustained 24p per share dividend — and the anticipation of greater FUM and new client money — that is lending some support to the price right now. 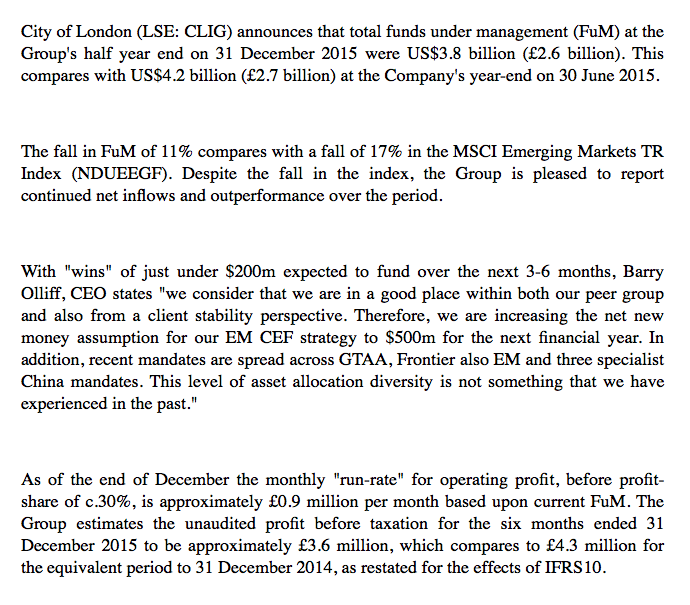 Oh dear — looks as is funds under management (FUM) have dropped to $3.5bn. 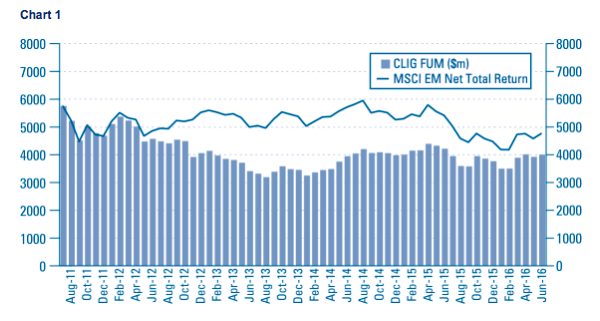 For some context, CLIG’s emerging-market benchmark (http://markets.ft.com/research/markets/tearsheets/summary?s=MIEF00000PUS:MSI) dropped 6% during the month. Using the revised FUM/FX table published within the presentation referred to in my comment above, current earnings could be running at £5.37m — equivalent to 20.0p per share — with £1 buying $1.45. The bid-price of 300p gives me an EV of 269p per share and an underlying earnings multiple of 13.4x. Not exactly a bargain and I dare say if FUM continues to plod along at $3.5bn then that 24p per dividend will have to be supported by the group’s cash reserves. These half-year results were essentially published in January, and I covered the figures and associated presentation in the original Blog post and first Comment above. However, today’s results showed fee income of £11,761k and post-tax profit of £2,594k. 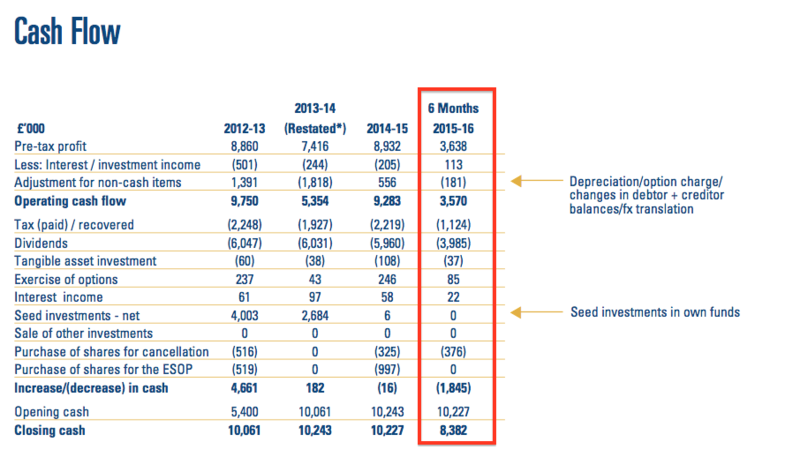 I am not sure the reason behind the discrepancies (there is a small discrepancy with the tangible asset investment number within the cash-flow statement as well). At least all the figures on the half-year balance sheet match those presented in January, and that the ultimate half-year-end cash figure has been reconfirmed at £8,382k. So the cash all adds up. 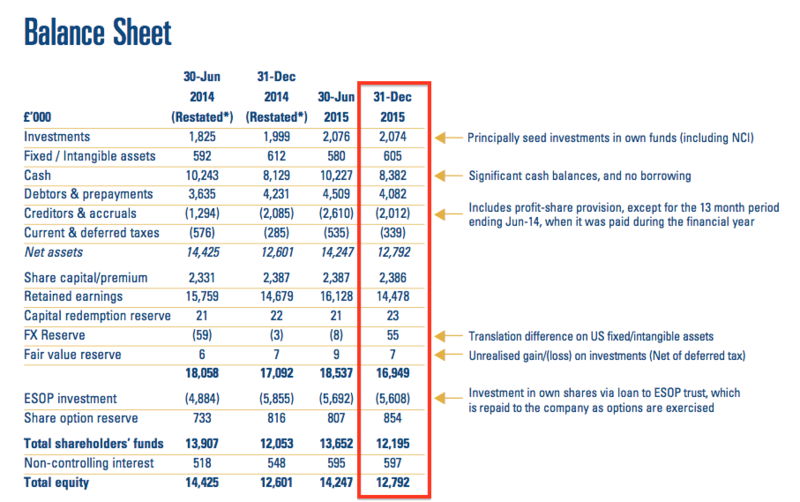 Today’s half-year results confirmed FUM at the end of January was $3.5bn (as per my second Comment above). ii) expectations of garnering an extra $750m of FUM during the financial year to June 2017. The AGM is held during October and “not during the next few months“. There could be an EGM called of course. Or maybe the plan will just be implemented anyway. I was dismayed in January when I discovered CLIG’s helpful FUM/FX earnings table had been updated to include operating costs of $8m (previously $7m) a year for the group’s US operation. I found it odd the cost base was rising when the management narrative referred to reducing costs. With FUM at $3.5bn and using the latest FUM/FX earnings table above (with US costs at $7m), current earnings could be running at £5.72m — equivalent to 21.3p per share — with £1 buying $1.45. The mid-price of 300p gives me an EV of 269p per share and an underlying earnings multiple of 12.6x. As before, not exactly a bargain and I dare say if FUM continues to plod along at $3.5bn then that 24p per dividend will have to be supported by the group’s cash reserves. “As I have previously noted, it is recognised by your Board that for many of our shareholders a strong and consistent dividend is particularly important. For this reason we have endeavoured over the recent more difficult years to at least maintain the dividend, whilst always ensuring that our finances have remained sound. In view of your Company’s strong balance sheet and cash reserves (cash and cash equivalents at end December 2015 were £8.4 million up from £8.1 million at end December 2014), your Board has agreed to maintain the 8p interim dividend payable on 11th March 2016 to shareholders on the register on 26th February 2016. A certain amount of wiggle room is given here and if EPS for 2016 does end up at about 21p, then the average five-year rolling dividend cover to 2016 would be (1.4x + 1.0x + 0.9x + 1.1x + 0.88x)/5 = 1.06x. So well below the 1.2x target… and that 1.06x ratio will go lower for the five years to 2017 as the 1.4x cover for 2012 drops out of the equation. Ultimately FUM has to increase significantly before that 1.2x cover is established — in the meantime, the payout will be funded on earnings plus part of the cash reserves. For what it is worth, that confirmed extra $200m of FUM would bring earnings to £6.32m or 23.6p per share — just about enough to justify another 24p per share annual dividend. That trailing 24p per share dividend supplies an 8% income at 300p. 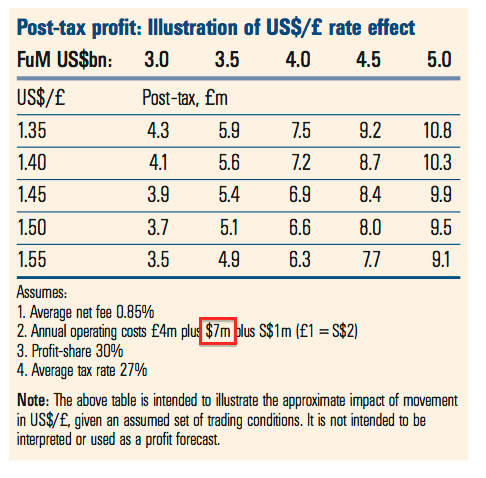 Using the latest FUM/FX earnings table shown in the Comment above (with US costs at $7m), current earnings could be running at £5.72m — equivalent to 22.0p per share — with £1 buying $1.42. Using the latest FUM/FX earnings table shown in the Comment above (with US costs at $7m), current earnings could be running at £7.18m — equivalent to 26.8p per share — with £1 buying $1.41. Difficult to say at this stage how much of the c$0.4bn increase during March was due to market movements and how much was due to additional client money. CLIG’s scheduled trading update for next week should shed some light on the improvement. Is this share a ‘turnaround’ situation, which is why you are happy to be paid the cash yield (With a declining net book value per share), while you wait; and capital appreciation will hopefully follow? I can’t see the rationale otherwise…TIA. I would not say this is a turnaround situation, as the business has not really fallen into significant trouble (at least yet!). Instead I guess you could say the business has been treading water for some years now, with client AUM faltering a few years ago and having been stagnant thereafter. Ultimately, greater AUM will drive profits and the share price higher. In the meantime, I can collect that the hefty dividend, which has represented the group’s entire earnings for some time now. I like this business as it is simple to understand, is managed by a owner-friendly boss, enjoys attractive financials and (in theory) ought to prosper in line with global stock markets. The business needs to continue to demonstrate investment out-performance for its clients, which should lead to greater AUM. 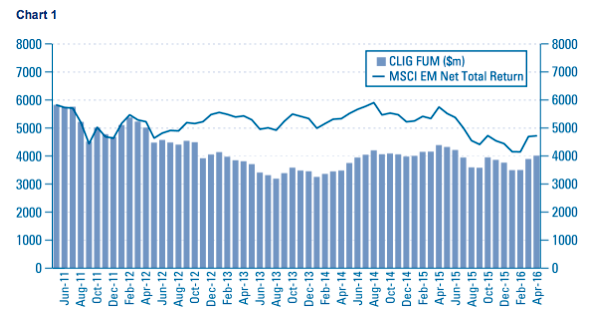 The ongoing downside is that the AUM is invested in emerging markets, which can be volatile and off-limits to certain prospective clients. 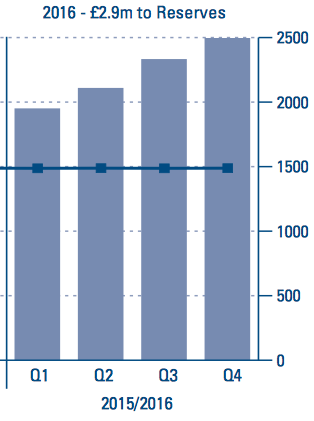 I think I am stuggling with the 10% reduction in book value which is only partially off-set by the hefty dividend. On the other hand, a revival in the markets they operate in is probably overdue, at which point clig should in theory have a beta greater then one on the upside, I guess…. For me, I think Ill wait for a technical chart move. Many thanks for your superb analysis. Sorry to correct my comment above (and not compare apples with bananas) I guess the reduction in book value is quite alot less than the divi, but on the other have the real divi is not the 9% it appears to be, if that makes any sense…more like 6%, as the balance is coming out of reserves..Good luck anyway. Book value reduced by £1,456k, or 10% as you say, during the latest H1 results. This reduction is explained largely by the dividend (£3,985k) and the share buyback (£375k). The divided paid during this H1 period was 16p per share and was the final dividend declared for the prior year. However, if CLIG’s 24p per share full-year dividend was instead paid equally (12p/12p) in H1/H2, then that payment would have been £2,988k, so £996k less. During H2, therefore (and all other things being equal), CLIG’s book value ought to recover that £996k purely because of the dividend weighting (8p/16p) between H1 and H2. 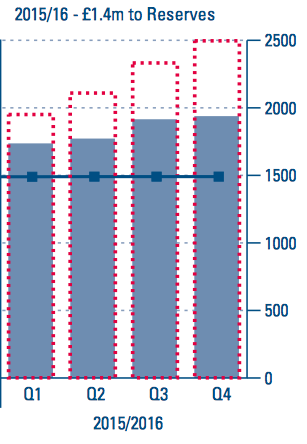 Factor in the £375k buyback as well and you get £996k+£375k = £1,371k of the £1,456k book-value reduction explained. Also, the cost of the 24p dividend is £5,954k a year going on the latest share count and excluding EBT shares (which do not receive dividends). My sums in the Comment post above cited possible earnings of £7m with AUM at $3.9bn, so there is room to cover the dividend payment were AUM to stay at or above the current level. 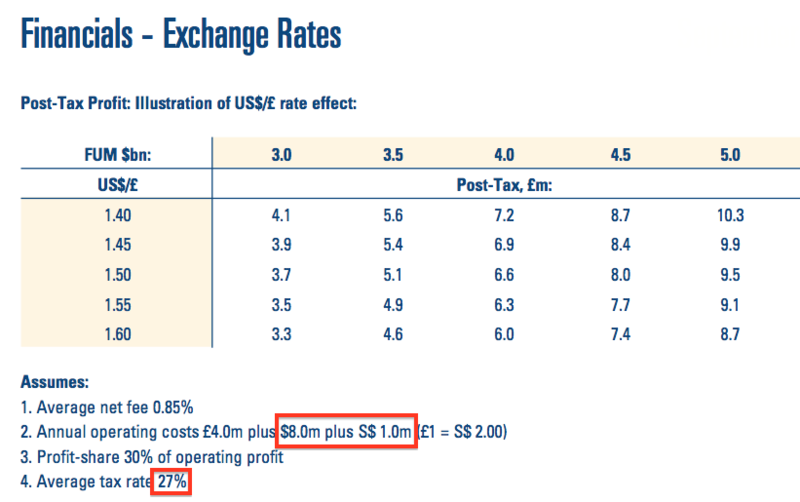 Using the latest FUM/FX earnings table shown in the Comment above (with US costs at $7m), current earnings could be running at £7.28m — equivalent to 27.2p per share — with £1 buying $1.44. 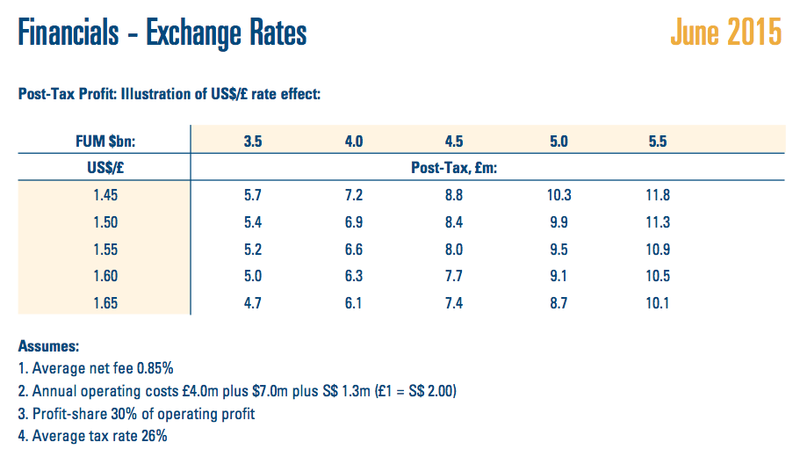 Using the latest FUM/FX earnings table shown in the Comment above (with US costs at $7m), current earnings could be running at £7.07m — equivalent to 26.4p per share — with £1 buying $1.45. 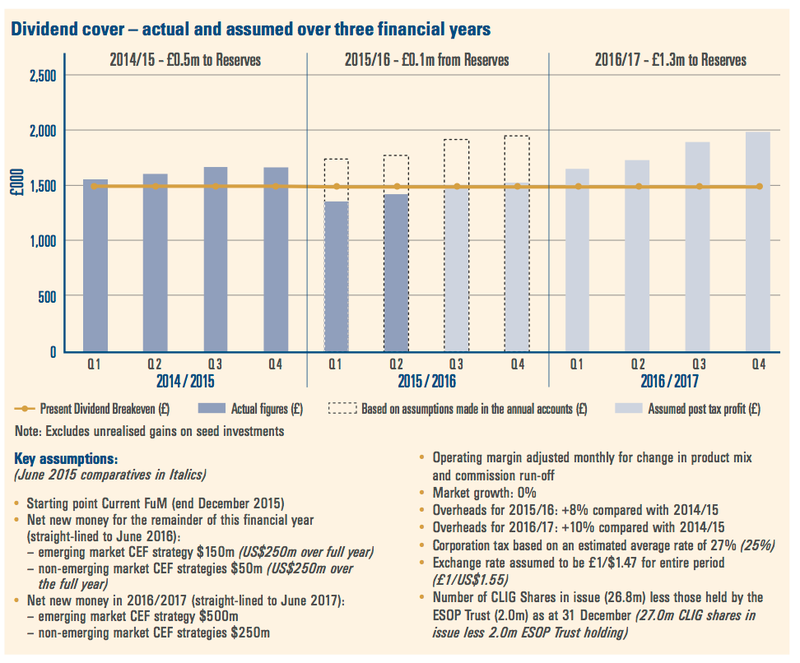 Using the latest FUM/FX earnings table shown in the Comment above (with US costs at $7m), current earnings could be running at £8.15m — equivalent to 30.4p per share — with £1 buying $1.32. Oh dear. 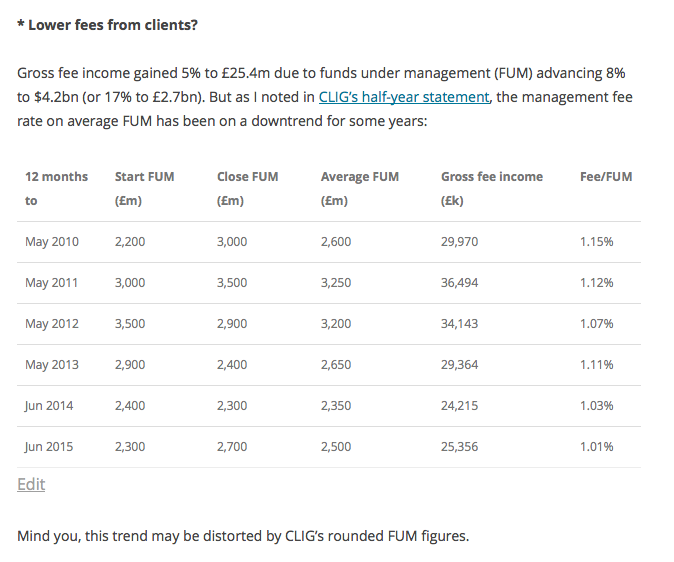 I have just noticed a glaring error with the FUM/FX table presented within CLIG’s February interim results. So it is not clear at this stage whether the cost should be $7m or $8m. I shall endeavour to find out what has happened. 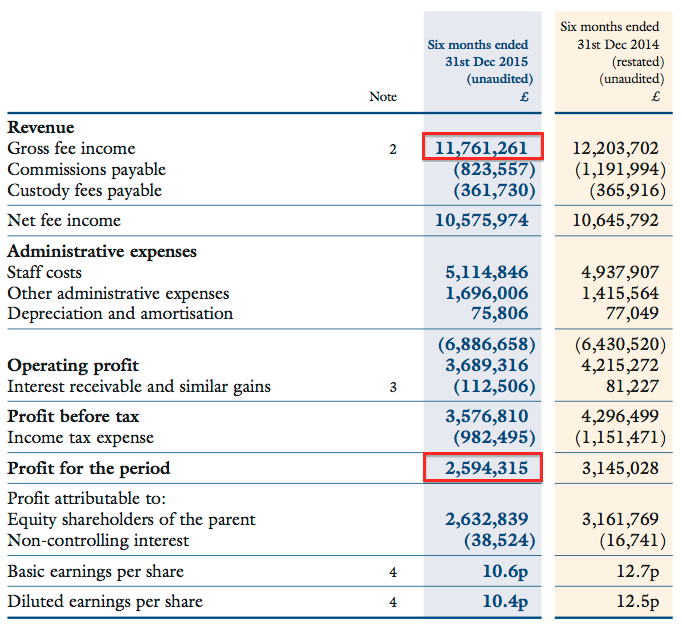 Anyway, FUM $4.0bn at £1:$1.32 with $8m cost equates to earnings of £7.77m and EPS of 29.0p.